L to R: Steven Luster, Carol Hamby, Sean Dixon, Robyn McNeely, Angel Bowman and Alexandra Weiland. 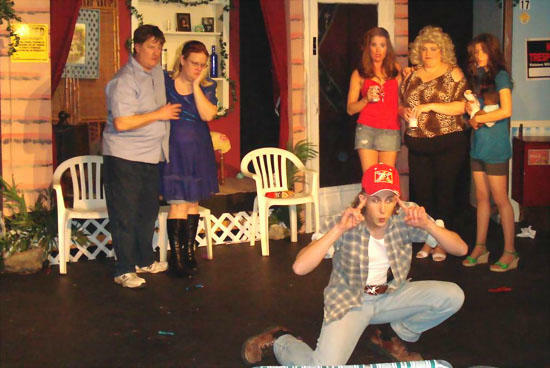 After playing to sold out crowds, The Great American Trailer Park Musical continues for one more weekend, Jan. 22-24, Friday and Saturday at 7 p.m. and Sunday at 2 p.m. Presented by Out Front Productions and performed at Murfreesboro Little Theatre 702 Ewing Blvd., Murfreesboro. Reservations and Info (615) 893-9825 or www.mltarts.com The show is directed for the stage by George W. Manus, Jr. Ticket price is $15.00. Seating is limited and filling up fast so reserve your today for some "Chair Crashin', Cat Scratching, White Trashin' Action and a Helluva Whole Lot More." The story focuses on strippers on the run who sleep with married men who live in the same trailer park and the agoraphobic, troubled trailer housewives who love them. The New Yorker call this musical "Joyful and unashamedly vulgar, the comic fable about women in a Florida trailer park and their no-account men is more fun that a chair-throwing episode of Jerry Springer." George W, Manus, Jr. founded Out Front Productions five years ago to bring to Middle Tennessee Stages thought provoking, edgy, and contemporary shows. This one fits all three criteria. Come out and support this vital theatre that offers an alternative to the shows that get produced year after year. If rated R movies are your thing then this show is for you!! The sold out audiences are calling this production "better than anything they have seen at TPAC," "Worth every cent of the ticket price" and Hurting stomaches from laughing for 90 minutes straight-wanting to return for another dose. Heat up the chilly January nights with this fun filled, action packed comedy gem. This show features the musical styling of The White Bay Freddie Band. Thanks to the Courier and the fantastic coverage! A BIG thanks for everyone who came out to make this show a HUGE hit!! George W. Manus, Jr.
(615) 869-8617 to reach me directly.